HETAS approved chimney sweeps – Perthshire. 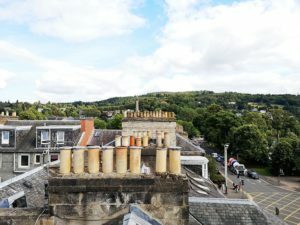 We are HETAS approved chimney sweeps offering chimney sweeping and chimney surveying services to the city of Perth and wider Perthshire, including Pitlochry, Crieff, Auchterarder and Blairgowrie. Not only are we a HETAS qualified chimney sweep business, but all our sweeps undergo extensive training provided by Guild of Master Chimney Sweeps. We are trained and equipped to service both domestic and commercial flues, including biomass, open fires and stoves. We have covered an array of chimneys all across Scotland, so please get in touch with us to find out how we can help you. issue HETAS chimney sweeping certificates to comply with insurance and warranty requirements. With 4 HETAS qualified chimney sweeps working in business, we provide a quality service to cities and towns all across Scotland including Edinburgh, Glasgow, Inverness, and many other towns and cities in those areas. We are trained specialists in “Power Sweeping”, which is a technique that’s clean, effective, and removes considerably more soot and tar than other methods of sweeping. We also offer CCTV surveys, sealed smoke tests, core ball tests and cresoste treatments to remove severe tar build up. To reduce the risk of house and chimney fires. To reduce the risk of dangerous fumes such as carbon monoxide escaping into your property. To maintain the high efficiency of stoves and boilers. To remove corrosive soot and tar from chimney systems – in particular from metal liners and chimney systems. Finally, you should make sure to get guidance on how frequently to have your chimney swept. We are more than happy to answer your questions or check out our main sweeping page for more details.